Sorry this one took so long to get posted, but I've had some pretty inspirational days the past few weeks that have been taking up the creative space in my brain! More on that in my next post... until then, let's talk about eating out! Eating out on Paleo is easy in the sense that you can always find an option. What makes it hard is there are so many other options that you would like to have, that aren’t Paleo! My husband and I only eat out about 2 or 3 times a month, so a lot of times I just let that be my cheat meal. But when I have work dinners, girls night, special occasions, people are in town, or when I am traveling it definitely helps to know how to order. When I am traveling, there are a few things that are important. I bring a Larabar and a packet of almond butter for every day that I am going to be gone. This becomes one of my meals or a snack. You can always find apples or bananas at a coffee shop or in the airport. Bags of almonds or cashews are also very easy to find. Chipotle or a “fast casual” salad restaurant are a great place for lunch. At Chipotle I order a steak or chicken salad and top with fajita veggies, salsa, and guacamole. No croutons, tortillas strips, beans or corn, your call on cheese. A few recent meals at nicer restaurants included a Caesar salad topped with cod for lunch, I just had them hold the croutons. And at a tapas restaurant I had an order of spiced nuts, side salad, mussels, and bone marrow. Mexican? You can get a salad topped with protein – chicken, steak, fish, shrimp. A vinaigrette is a good option, but I find salsa and guac to be a nice change. At a pub? Salad with protein is easy, but you can also order a burger or chicken sandwich with no bun, add bacon and mushrooms and caramelized onions. They always ask you to choose a side, so a side salad is best, but sweet potato fries are good too. I promise they are used to people asking for no bun! I do it all the time. Pizza. I don’t do this often, but I have no problem finding gluten free pizza here in the Boulder area. I have found them to be quite tasty and great for thin crust lovers! I know that’s not the case everywhere, so order a side salad and eat the toppings or better yet, just make it your cheat meal. Steak houses are easy. Just stick with meat and veggies. BBQ is also easy. Stick with the meat and find a green veggie option and go ahead and eat some potatoes! Asian restaurants also have a lot of meat and veggie options. And make sure to get sashimi instead of rice based sushi. What other restaurant types do you have questions about? If you missed the basics of Paleo and how to plan, check out Part 1 and 2. Talk to you soon... I am so excited about some things that are manifesting in my life and can't wait to tell you about it! 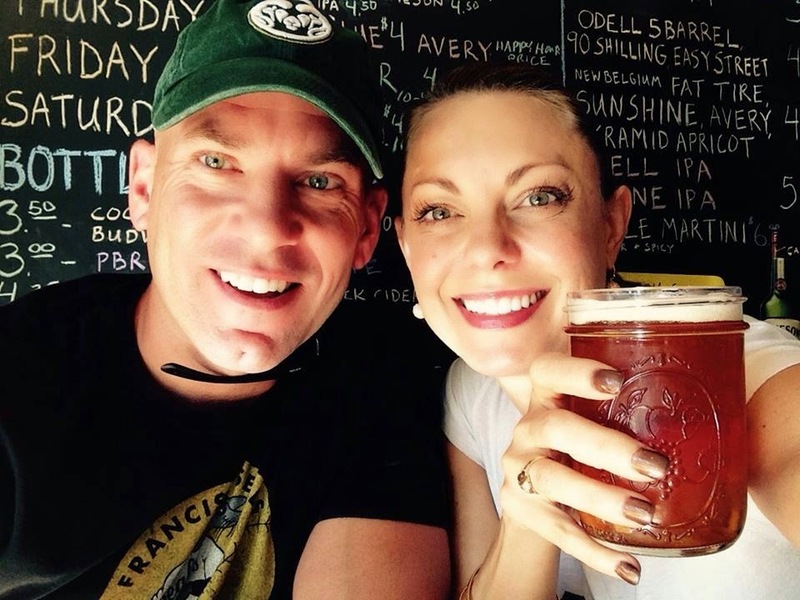 Part 2: What Can I Eat on Paleo? The biggest challenges I hear from people that struggle to maintain a Paleo diet are that it is boring, it is hard, and they don’t have time. All the time people ask, "What can I not eat?". But try to think of it in terms of "What can I eat?". First, I love food and I love cooking, so you know I am not going to eat boring meals. You’ll see in my weekly menus below that there is a great variety, different ways to use the same ingredients, and the meals are satisfying. As for making the time, you have to plan and prep. Schedule it into your day. Here’s how I do it. I make a 7 day menu and list all the ingredients I need. We go to the store on Friday after work. I make a list of everything that I can prep ahead of time – spiralizing zucchini or sweet potatoes, ricing cauliflower, shredding cheese, cutting onions, bagging smoothie ingredients, making sauce or salad dressing, smashing cauliflower or mashing potatoes. I always keep throwaway Tupperware and baggies on hand. On Saturday or Sunday I spend an hour or 2 prepping the food for the week. Turn on some music and depending on the time of day, have a cup of tea or a drink and it can be quite relaxing! Also, I like to make something on Sunday that we can eat for a few days, as you’ll see below. Here are 2 examples of my weekly eating plan with recipe links and notes. I start on Friday because that is when I go to the store and my food plan starts. Italics mean that I prep that during my weekend session. 10:00am – Larabar (optional if I had a hard workout). These typically have 2-5 ingredients. My favorite is Cashew Cookie and it has cashews and dates. That’s it! I could make them, but this is easier to keep on hand in my desk. 12:00pm – Veggie salad with avocado and scoop of tuna salad and balsamic dressing. Let’s call this the “Betsy salad” going forward because I order it everyday at the office. 7:00pm – Tacos – Seasoned ground beef on cauliflower tortillas with lettuce, tomato, avocado, salsa, and small amount of good white cheddar. 12:00pm – Mixed greens with roasted beets, honey smoked salmon (I am in love with this), slivered almonds, balsamic dressing, and a small amount of goat cheese. 7:30pm – Baked chicken on mixed greens with avocado, tomato, and salsa. 3:00pm – Chocolate from Europe. The guys I work with in Europe always keep me stocked up! 7:30pm – Beef stew. Pop tart for dessert. 7:30pm – Chicken sandwiches (husband gets a bun, I wrap mine in lettuce) with caramelized onions, avocado, and mayo. Served with sweet potato fries. Check out Part 3 for my tips on eating out. Enough with the heavy stuff… let’s talk food. Last March I drastically changed my diet. I went Paleo. Well, about 90% of the time. I did it for vanity and fitness reasons (to lose weight) but found that there were a lot of other benefits. I feel better, have more energy, look better, sleep better, and lowered my cholesterol and blood pressure. I’ve also quit referring to what I eat as a diet because it’s really my lifestyle now. And I’ve found it to be quite easy. I’m going to give you an example of how I do it, but first what the heck am I talking about? Paleo focuses on meat, veggies, and limited fruit, nuts, and seeds… essentially real, one ingredient foods that have not been processed. You cut grains, legumes, sugar, and most dairy. You can eat some dairy: butter, full fat cream, and even some say that high quality cheeses are acceptable. 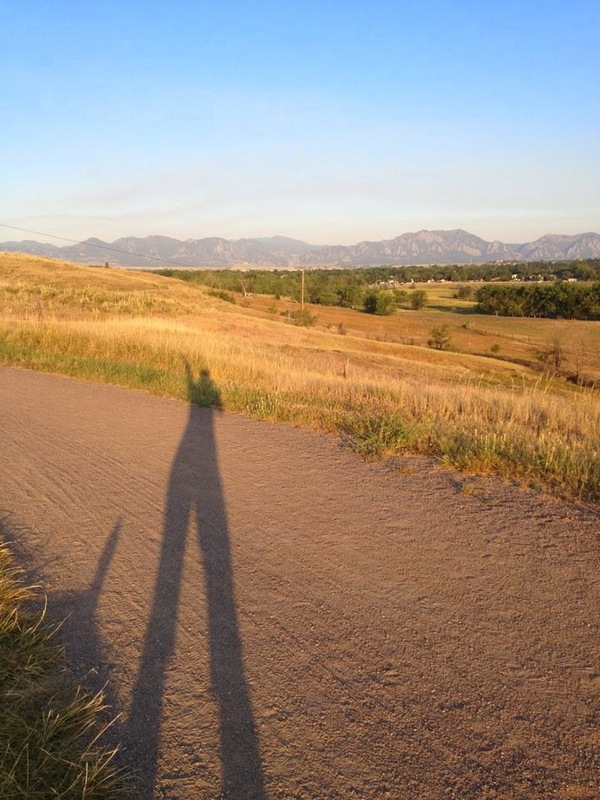 There are a lot of definitions of Paleo, so I approach it based on what my goals are. If I am not training for anything or am in a maintenance mode, I will be a little less strict, even adding in 1-2 cheat meals a week. If I need to drop a few because my pants are tight or I am training for a competition, then I drop the cheats, cheese, and higher fat meats and nuts. · Never buy foods with a long ingredient list or ingredients that sound like chemicals. Stay on the perimeter aisles of the grocery store and when you need easy meals and snacks, I like Larabars and those small packets of almond butter. They are a great example of packaged foods with a few ingredients. · Plan your meals. Before you go to the store know what your lunches and dinners will be, print out the recipes, and write a list. · Take an hour or so on Sunday and prep as much food as you can. Chop, spiralize, and bag veggies and fruit. Pre-make any sauces or dressings you need for the week. My first challenge was figuring out how to do this with a husband that was not going to eat this way. And tonight’s meal is a great example of how I do it! Bear with me… the explanation is a lot more complicated than it is, I swear! Mine is in the front! He gets regular brats, Boulder Sausage brand are the best. I get chicken apple brats, Saag’s have been my favorite so far. I buy a package of each and freeze half, so we have another meal ready later in the week. His is served as you know it, on a bun. For mine, I use the “brat as a bun” technique and cut down the middle of the brat and put my condiments inside. 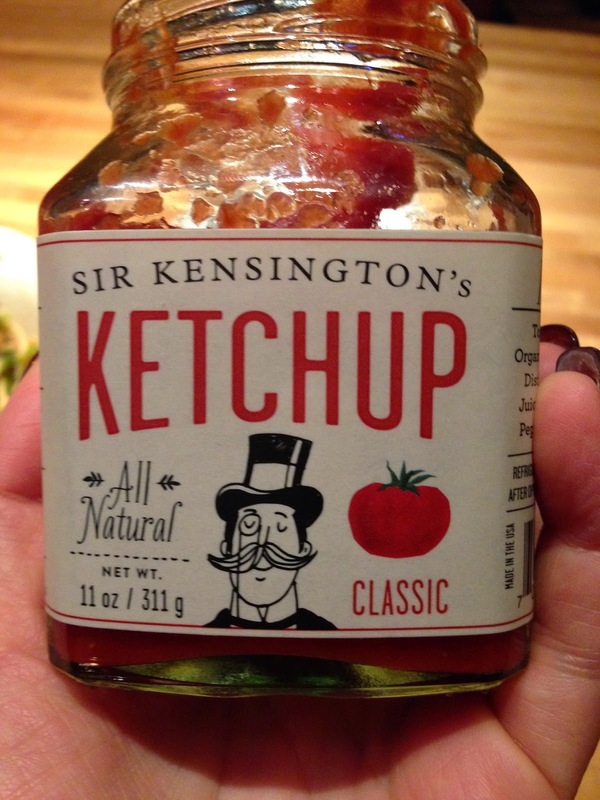 There is even a brand of Paleo friendly ketchup, mustard, and mayo called Sir Kensington’s. Easy! We both win! Now for the sweet potato fries. This was one that I wasn’t sure I was going to get him to be excited about, but the first time I made them he said, “These are good. We can have these anytime you want.” Trust me when I say that is a compliment! 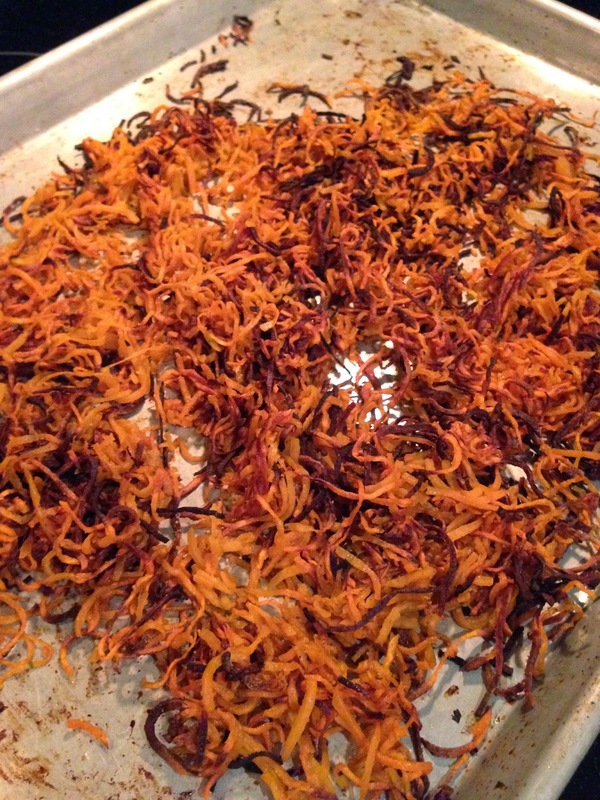 I got a vegetable spiralizer and it has been one of the best purchases ever! Paderno brand on Amazon for under $40. I take the skin off and spiralize 2 sweet potatoes, coat with coconut oil and garlic salt and bake on 400 for about an hour. Note, I only eat potatoes or sweet potatoes on days that I lift weights or have over 60 minutes of exercise. They are carbs after all. Last, the Brussel sprout salad. 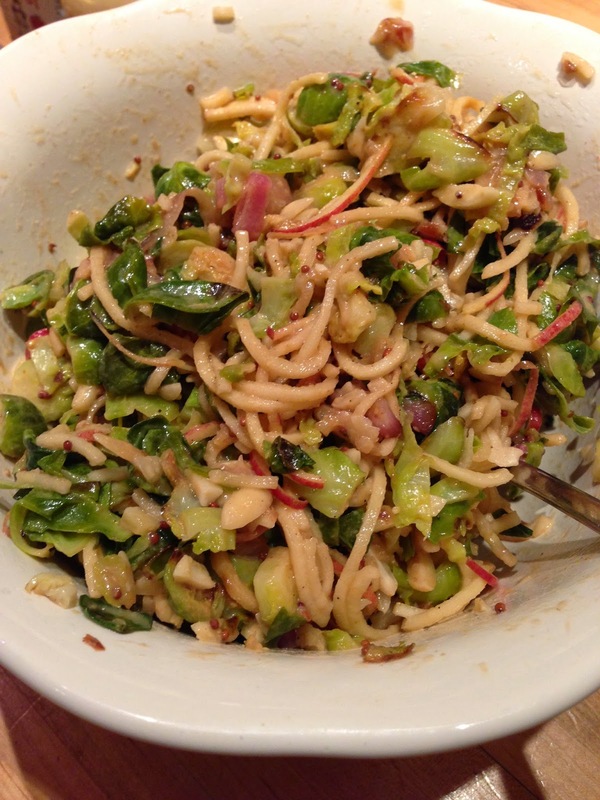 It has shallots, spiralized apples, slivered almonds, and shredded Brussel Sprouts tossed in a mustard, honey, apple cider vinegar, and Siracha dressing. It makes a few servings so now I have lunch for the next few days… I just top with smoked salmon, a package of tuna, or a chicken breast. Here’s the recipe if you are interested, it’s from the best spiralized recipe creator on the planet., in my opinion. 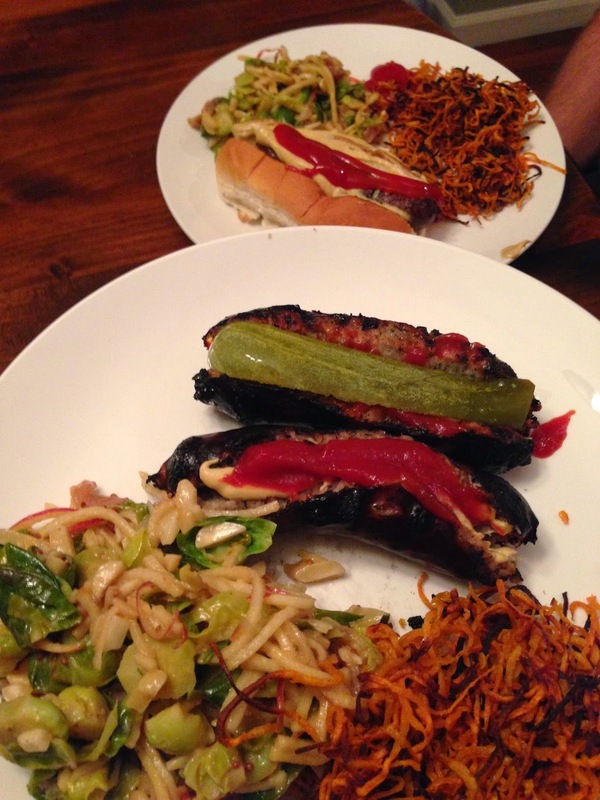 In Part 2 of the Paleo series I’ll give you a few examples of weekly menus that comply. Part 3 will be how to order at restaurants. What else do you want to know? 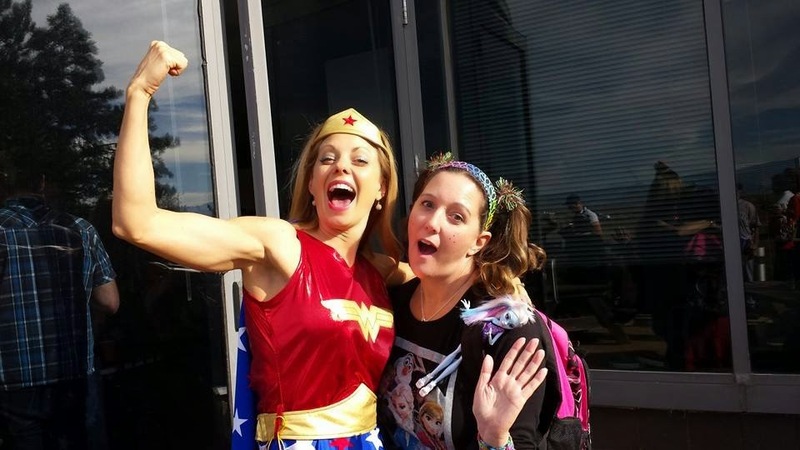 When I first got into sales, they paired me up with a senior sales rep to show me the ropes. Bob was a very successful, experienced rep with a dry, sarcastic sense of humor that had no tolerance for stupid, fancy, or ego boosting behavior. I don’t think he liked very many people, but that was just my perception as a 25 year old. Anyway, we got along very well. In fact, he became a person that I hold in high regard and have quite an affinity for. Of all of the things he taught me – how to organize your territory, how to make the most of a business trip, how to get people to give you information, how to ask for the deal – the most important thing was to never look at the menu until you have had your first drink. We traveled together a dozen or more times and I was on his timeline – I mean, he’d been doing this for years on his own and then the company forced him to take this spunky, optimistic, overly confident young thing under his wing – I knew I had to be careful not to cramp his style. His routine at the end of the day was to find a nice restaurant, you never eat in your hotel room, order a drink, once it’s finished and only when it’s finished, look at the menu and take your time to choose what to order. I loved this then and still love it today. It forces you to slow down, it forces you to have a conversation or think, it is a ritualistic activity that changes the pace of a crazy day. Because you savor your drink, you then savor your meal, your time, and you savor your experiences. I still do this. And take the sentiment into other activities. 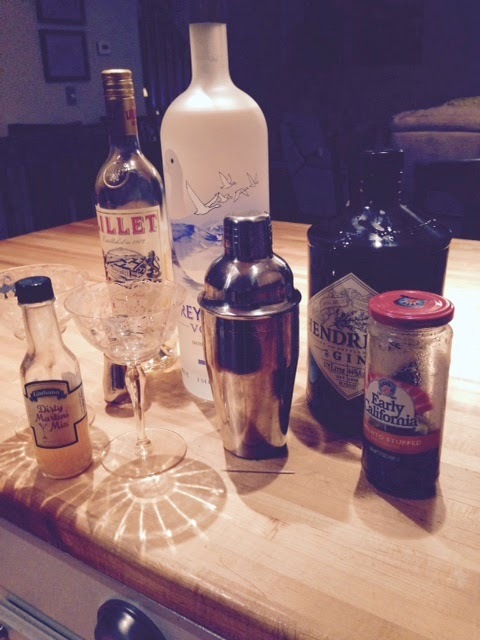 When I am at home, I take my time making a proper James Bond martini – 2 parts Hendricks gin, 1 part Grey Goose, Lillet, dirty, with blue cheese stuffed olives. I chill my vintage cocktail glasses I got from a dear friend, hand stuff the olives, measure the ingredients, shake exactly twenty times, serve topped with extra olive juice, and take my first sip with my eyes closed. I love this ritual. I enjoy it. I savor it. It signifies the end of one part of my day. And it is a physical and mental shift into enjoying my night at home. I was recently thinking back on my first job out of college and who inspired me. In 1999, at 22 years old, I started at a technology company and there was a lady on my team named Robin. She had been doing the job for a while, been promoted, was well-spoken, smart, effective, and held her own at the table. In my mind, she had it together. That was what I wanted to be like! I reached out to her for advice and had lots of questions for her. She always treated me with respect, kindness, and encouragement. We did not work together very long, but I vividly remember her influence on my path. 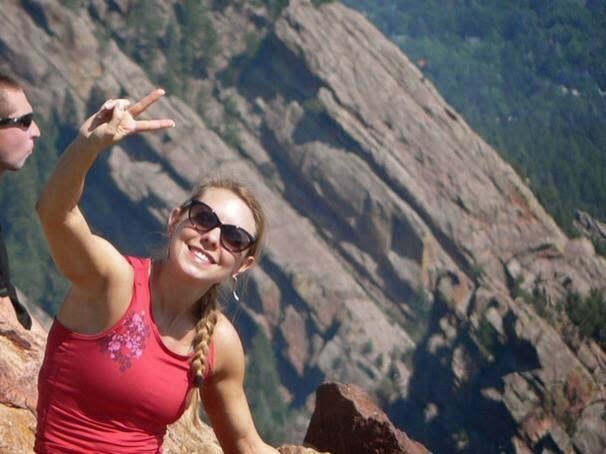 Out of curiosity, I looked her up on LinkedIn and imagine my surprise to realize she was only 27 at the time. 27?! To me now, a 27 year old is still early in their career but at the time I held her in such a lofty spot in my mind. Can you imagine what I must seem like, at 37, to a person right out of college or early in their career? I think we go through the day, not very aware of the shadow we cast. While I am just B, who calls my mom on the way in to work most days, who doubts and questions myself, and who feels exactly like I did at 22 around some people… I have also been doing this a while, I’m pretty good at it, I am confident, I have been described as intimidating. Can you imagine the shadow “just B” might cast? I’ve seen what impact a positive statement can have on someone and how they take it to heart and repeat it to others – I do this when I get a compliment from my boss or someone I respect. I’ve also seen how an abrupt, negative comment can bring someone down, even reducing them to tears – and unfortunately I’ve been on both sides of this situation. I feel a great sense of responsibility to treat this shadow - or level of influence - with more respect going forward. I want to be conscious of how my words, actions, body language, and conversations can have a positive or negative impact. - As I carry on throughout the day I will smile, I will engage in pleasantries more often, I will take more time to ask a question or answer one, I will radiate calmness and happiness. - When I have the chance to say or do something positive, I will do it. I will compliment my coworkers to their bosses, I will give praise more willingly, I will appreciate and thank people more often. - When I have to say or do something negative, I will do it with more care. I will do it with kindness, constructively, with a great deal of thought, and very aware of the situation and people around. There are going to be situations when confrontation must happen. But I will judge more carefully when I have to go into “Pepper”-mode (Pepper is my alter-ego and is kind of a diva). It must be standing up for something that is right that I believe in or standing up to something that is wrong. I want this to happen with the right level of emotion and with people that can handle it. I’ve already started acting on all of this and I love seeing how the more you give, the more you get. Positivity grows, conversations are richer, relationships are stronger, and I’m having more fun! I reached back out to Robin a few months ago to tell her what an influence she had on me and what a great example she was. We had a great email conversation catching up on the last 14 or so years and hope to get together for lunch soon to really catch up. Those are going to be some big shadows! I love the thought of having a yearly intention. I got the idea from my mom, with her concept of word that she wants to focus on in the coming year. The idea solidified with last year’s workshop where I came up with my 2014 intention: Be a tree. I went back to the workshop New Year’s Day again this year and was once again moved by the camaraderie and coming together of a roomful of people to gain clarity to our individual purpose. It is inspiring and emotional to see what people are aspiring to and I was not the only one with tears in my eyes as we shared our intentions with each other. 2014 was truly an amazing year, in all facets. I grew more than I have in any other year. I am a stronger, happier person with a better foundation to deal with things that come my way. I have put a lot of thought into what 2015 is going to be and how I can continue to grow. A few things have motivated my 2015 intention. I recently read an article where nurses recounted the top things people said they regretted on their deathbeds. The number one regret was not living the life they wanted to live, but living within the expectations of others. It stuck in my head for weeks. My husband and I have a lot of similar interests and enjoy our time together, but like every couple we have some interests that just don’t cross over. Kind of clunkily, I mentioned to him that I really wanted to go to Paris and visit the Louvre for a few days, vintage shop, and eat escargot and pate… and there were some other places I wanted to visit in a way that he may not enjoy as much… and I felt like this was something I should do on my own… and I didn’t want him to take that as a statement that I didn’t want to travel with him... because I love our vacations together. How lucky am I that his response was, “As long as you don’t go to Italy without me and we go to the beach once a year, you should do it!” So, I am! I booked a solo trip to Paris to spend a week visiting museums and acting on my whims and going at my own pace. I think the biggest realization to me was that I was creating those “expectations of others” in my own head. I anticipated that he would not support my dreams because they were not his and I was so wrong. The second major impetus for my intention is the year I have coming up at work. When putting the annual plan together I was surprised to see month after month of major presentations, product launches – yes plural, and industry and press events – yes plural. Never in the history of our company have we had so much cool stuff hit in one 12 month period. And I am excited! I have the right team and the right support and I can organize and plan the hell out of it. Stress? Of course. Will things go wrong? Yep. But, that’s okay. It will fuel my motivation. And I am going to enjoy every minute of it! The third thing is more of a feeling that I can only describe by painting a scene. It’s as if I am all dressed up and walked into a party. There are interesting, beautiful people all around talking and laughing. They are people that I look up to and respect, who do amazing things that inspire me. They are people who have given me advice and opened doors for me. They are people who are confident and create and do and act, with seemingly no fear. They are people that I want to be like. I am standing just inside the door and not sure where to go or what to do. I want to walk in and feel confident joining this group of people, listening and sharing and laughing. I think I belong here but not quite sure how to be a part of the party. This is the year that I am ready to be a part of the party. It was December 26, 2013 when I got some news that made me realize I had to grow. Really fast. My well-loved, amazing boss let me know she was leaving for a new opportunity and was putting me in a position to own the bulk of the marketing department. Not only was I taking on new responsibility for things I had never done before, I was the face of the department to our CEO and executive team, and I had to navigate the emotional aftermath of the team who’s respected leader was gone. I was scared and that is an understatement. 2 days later, on a Saturday, I had lunch with my new boss, the CEO, and the full weight of what I had on my plate hit the hardest. He has high expectations, rightly so, and it was clear he had full faith in me to rise to the occasion. So, what did I do? I faked it. Faked calm, faked grace, faked confidence. But I was none of those things. On January 1, 2014, I went to a yoga class. Yes, we did yoga, but it was also an intention setting workshop. During the class, the instructors passed out paper and pens and led us through a series of questions. I kept my notes from that day and I reread them yesterday. What was I most proud of in 2013? Movement and growth. What did I want to let go of? Franticness and emotional ups and downs. What make me feel the most happy? Stability, learning, physical movement. What were my goals for 2014? Harmony and stability. I left that class with a clear vision of how I would approach 2014: Be a tree. To me that meant being grounded, rooted, strong, standing tall. It meant being flexible with wind and storms and seasons. It meant being connected and part of the earth, water, air, and everything around me. It meant protecting and comforting those around me. It meant growth. My body and demeanor physically change when I talk about what this means to me. Just using the phrase has become a way for me to calm and settle myself. 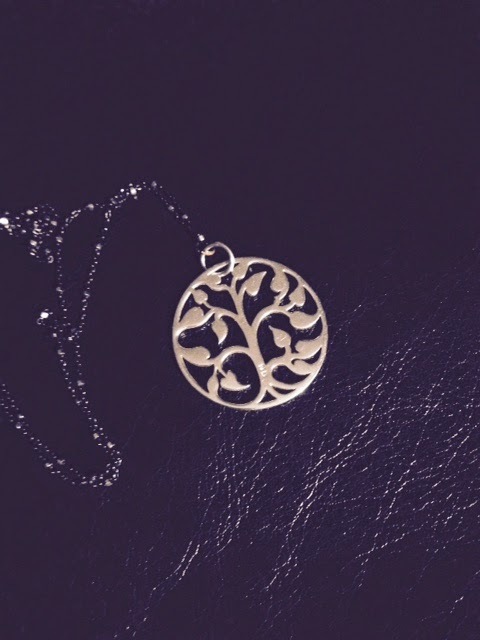 I bought a necklace, wrote the phrase in places I would see it often, not a day went by in 2014 when I didn’t think, “Be a tree”. What I found all of a sudden was that I wasn’t faking it. I really was calm and graceful and confident. I wasn’t scared to not know something because other people did and they helped when I asked. I wasn’t stressed by change because that is the only constant. I wasn’t overwhelmed by my circumstance because it is how I have and show stability, it is how I learn, and it was certainly a year of movement. I came up with this phrase in connection with my job. But because everything is connected and one thing influences another, I found that ALL parts of my life improved in 2014. - Yes, I have a job and career that I love. I know what I do well and I know what I must rely on others for. I know where I need to learn and where I need to let go and let others step up. I have a team that inspires me and amazes me every day. They make me want to put them on a stage, shout out their successes, reward and encourage, open doors, and move mountains for these people. I have a boss and peers that are genius in their positions and it’s like earth, water, and air to my tree - we all work together to make things happen. I am blown away by the minds and skills of those I work with every day. - Through my quest of learning and asking for help, I have found a mentor that challenges and encourages me. I left lunch with her a few weeks ago and sat in my car with tears in my eyes because I felt so confident, supported, and heard. She says the right thing to show me that I’m on the right track and have the right ideas, but gives me that little extra thought or nudge or idea that makes it better. And she has introduced me to other mentors and contacts that are expanding my knowledge and confidence. This does not diminish the day to day friends and mentors that have given me confidence and help over the year. From conversations with my mom on the way in to work to deep discussions with Bob to guiding wisdom from my female peers at work, I am surrounded by knowledge! - My friendships are deeper. The exchange of ideas and advice and understanding are more enriching. I have found myself leaving lunch or dinner with a girlfriend in large, deep emotional states. I have been comforted, laughed so hard it hurt, had my perspective changed, felt braver, celebrated, and cried. The give and take this year was so natural and authentic. - I completely changed my diet and fitness. Do not take this lightly – I could never have achieved all I have this year without taking care of myself first. It changed the way my body felt. I have more energy, feel better, and look better than I ever have in my life. I need less sleep (6-7 hours), my skin is clear (no hives), my hair is healthy (it was falling out in 2013), my blood pressure is low (it was 180/100 in June 2013), my cholesterol is under 200 for the first time in my adult life, I am at my college weight. And I look amazing (and totally okay saying that)! At 37 years old I stepped on a stage in a bikini competition and placed. It is no longer a short term diet or fitness fad, it is just how I live my life. - My house runs like a machine. I am lucky to have a very organized and amazing husband who steps up in all kinds of ways. From paying bills to cleaning to dog care to car maintenance, we have our system down pat. We manage to have relaxing downtime and fulfilling connections because we are consistent in the basics. Ever heard of Maslow? This is the bottom of our pyramid. - Which brings me to my marriage. We have been together for a long time. Our first date was December 31, 1999. We married January 10, 2007. By far, this year has been the strongest, best, most fun year ever. He is my best friend. He has supported my career, my crazy schedule, my lifestyle changes, and my whims completely. We have high expectations and standards and have learned how to support and compromise so both of us have our needs met. We are STEADY. What an unromantic term to use for a relationship, but man, it’s the best! It allows for room to grow in other ways, which just feeds more awesomeness back into our relationship. In May we went to Mexico for a week and both call it the best week of the year. I cannot WAIT to do it again with this man. What an amazing year. All of it, even the hard parts. And there have been some really hard things this year – being asked to do things I’ve never done before, expectations I didn’t know if I could live up to, messing up, change, and loss. But, I have felt confident in rolling up my sleeves and digging in to whatever comes my way. And these challenges made the good things even better. I am blessed and thankful. I am a tree.